Donor Wall – Neighborhood Health Clinic, Inc. 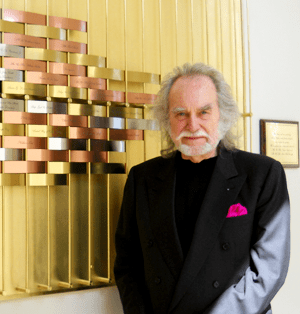 The Neighborhood Health Clinic is honored to have had Mr. Louis Nelson, international designer and visionary, create the donor appreciation wall. The art work displayed in the front foyer consists of copper plaques woven into a copper grid frame. The construction of the donor wall was underwritten by Clinic donors Mr. and Mrs. Vince Foglia and Mr. and Mrs. John J. McDonough. Among his many accomplishments, Mr. Nelson designed the 164-foot mural wall for the Korean War Veterans Memorial on our Nation’s Mall in Washington D.C. He has created, among other things, the stations murals for the Port Authority of New York and New Jersey PATH Stations, and has added clarity to information systems at places like New York’s JFK International Airport, the transit centers at the World Trade Center and the site of Ground Zero. He designed the United Nation’s Dag Hammarskjold Medal to honor each life lost in UN peacekeeping operations retroactively to 1947, album covers and the nutritional fact label that appears on virtually every food product sold in this country. “Design sets a stand that affects our attitude toward quality and our sense of well being,” Mr. Nelson Stated. The Neighborhood Health Clinic is proud Mr. Nelson has chosen to shape its environment and honor its donors in his unrivaled style. Please contact Keith Maples,CDO, to discuss your current level of giving and how you can be honored on the wall.